Interest in Appalachian culture is at an all-time high. 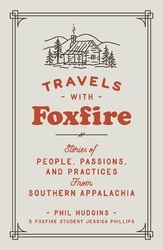 Since 1972, the Foxfire books have collected the oral history, crafts, and customs that define life in the Appalachian Mountains. This 16th book in the series captures the music, the history, the food (and drink!) and especially the stories of men and women throughout the region. Discover the secret history of NASCAR (it involves bootleggers). Hear from the world’s foremost expert on privies. Uncover old family recipes for buttermilk corn bread, apple fritters, barbeque sauce, and more. This joyful celebration of a distinctly American culture compiles the wisdom of the artists, craftsmen, musicians, and moonshiners who call Appalachia home. Includes more than 100 photographs.